"This book is great! If you are looking for spiritual, inspiring and life changing things to happen in your life, this is the book to get. I initially read this book on my Nook, I was so impressed, I decided to order the paperback book. Even though you can choose topics and bookmark them on the Nook, I find it very useful for me to highlight and add notes in the book itself. I read it at least 2-3 times a week. Very uplifting. Nice book for gift giving as well." 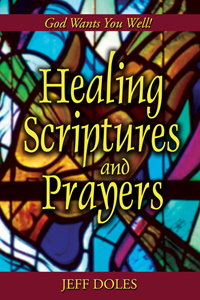 "Healing Scriptures and Prayers" by Jeff Doles is a faith-building book that will increase your confidence in God's healing grace in answer to prayer. The book begins with Old Testament healing Scriptures, covers the Scriptures concerning healing in the New Testament, the healing ministries of Christ, the disciples, believers in the Book of Acts, and then concludes with healing in the Lord's prayer and the Lord's Supper. The author also relates the Biblical accounts where people were raised from the dead to life again. The greatest hindrance to receiving healing is doubt concerning the willingness of God to heal, and this book demonstrates from the Bible that God wants His children well. Since the Word of God reveals the will of God, the Scriptures the author shares build the reader's faith and confidence. Romans 10:17 declares that faith comes by hearing and hearing by the Word of God. The prayers in the book will help the reader release his faith and receive from the Lord that which He has so wondrously provided through His redeeming death on the cross. The author teaches the reader to pray the Scriptures back to God. If you are dealing with health issues and need a boost in your faith to help you trust God for healing, this book will definitely provide it for you. If you desire to help others receive healing from God, this book is a valuable resource that presents the Biblical foundation for healing prayer. Since purchasing this book last year, I have found it to be both personally refreshing and a valuable ministry tool in my work with individuals in recovery from various addictions. The book conveys God's great love, promises of healing and freedom, and offers simple, practical prayers that will awaken the word within your heart, and activate faith for the supernatural! This book is great if you are just learning about healing, needing a healing or wanting to minister healing. When I was quite sick, I had a hard time concentrating, but I could follow the cd along with the book. It was a life saver! "I ordered this product because I was looking for Scriptures I needed to apply them for the need I had for healing in my body because I was sick. I found just what I was searching for and was dramatically healed in Jesus name. It did not take a long time. In a matter of days before I finished reading the scriptures and praying the prayers included in the book, I was healed. Thank God for the book, author and for Amazon.com for offering this book online!"